MT. VERNON, NY, May 24th, 2018 – Durante Rentals has made it on to this year’s RER 100 list of the 100 top-earning rental companies in the country. Coming in at #86, with $20.3mm in 2017 rental revenue ($30.8mm total revenue), this is Durante Rentals first time on the list. They join an exclusive group of rental companies with a combined $21.917 Billion in rental revenue. That figure surpasses their prior year’s total rental revenue of $19.299 Billion, an increase of 13.6 percent, and an all-time high. Durante Rentals rental volume increased by 16 percent in 2017, in large part due to the opening of two new locations, one in Brooklyn and the other in Danbury, Conn., their first outside of New York. Their earth-moving division, New York Takeuchi, was also awarded and expanded territory to now include eleven counties in Northern New Jersey. Their New York - New Jersey Takeuchi division is now one of the top Takeuchi dealers in the country. The year also marked the fifth consecutive time Durante was named to INC 5000 Magazine’s List of America’s Fastest Growing Private Companies. Founded in 2009 by three entrepreneurs, Durante Rentals is the most dependable name in construction equipment rentals with locations in the Bronx, Brooklyn, Brewster, Carmel, Elmsford, Flushing, Mt. Vernon, West Nyack, Danbury, and coming soon to New Jersey. Contractors look to Durante for all their construction equipment needs including telehandlers, scissor lifts, generators, boom lifts, conveyors, track loaders, skid steers, ride-on rollers, forklifts and more. Durante Rentals services all five boroughs of NYC, Westchester, Rockland County, Putnam County, Connecticut and New Jersey. For more information about Durante Rentals, visit www.DuranteRentals.com. or call 1-800-DURANTE. For more information about their subdivision, New York – New Jersey Takeuchi, visit www.NYTakeuchi.com. 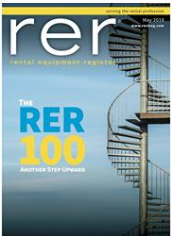 RER has been the acknowledged source of information on the rental industry since 1957. Editor Michael Roth is an expert in the industry and has authored hundreds of feature articles, visited hundreds of rental centers and manufacturers, and written thousands of news stories. He leads an award-winning editorial team that delivers hard-hitting industry news—from fast breaking stories about major players to new product launches and marketing strategies. 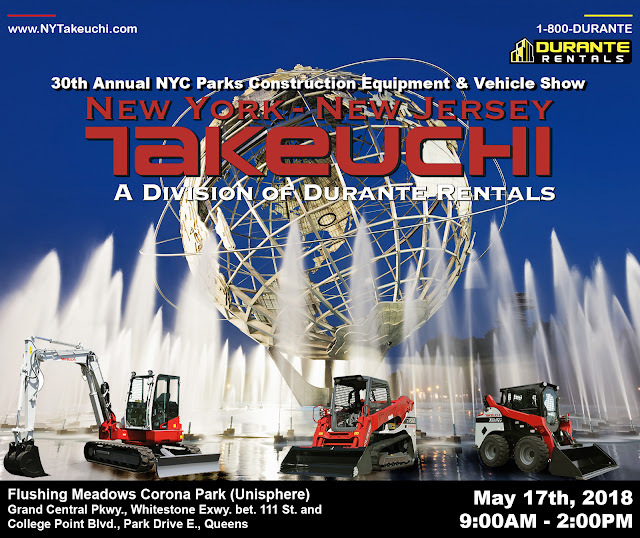 FLUSHING, NY, May 3rd, 2018 – Durante Rentals and their earth-moving division, New York – New Jersey Takeuchi, will be showcasing their construction equipment at the 30th Annual NYC Construction Equipment & Vehicle Show. This free event, hosted by the NYC Department of Citywide Administrative Services and NYC Parks, will take place on Thursday, May 17th from 9:00 am till 2:00 pm, in Flushing Meadows Corona Park. The rain date is scheduled for Friday, May 18th. Durante Rentals will have an assortment of construction equipment on display around the circumference of the Unisphere, including their Takeuchi mini excavators, track loaders, and skid steers. All Takeuchi machines are manufactured with Tier-4 Emission Compliant engines making them a perfect fit for this year’s emissions-reducing themed show. As an exclusive dealer for Sherpa Mini Loaders, they will also be featuring their newest edition to their fleet, the SHERPA 100 Eco Electric Mini Skid Steer. Attendees are encouraged to take an up-close look at these powerful, earth-moving machines. This is Durante Rentals fourth consecutive year exhibiting at this event. The show always draws a large crowd and is well-known for the array of cool vehicles, vendor giveaways, product demos, and complimentary BBQ. “This has always been one of our favorite equipment shows of the year,” said Adam Zunic, Director of Marketing at Durante Rentals. “The iconic Unisphere is the perfect backdrop to showcase the latest in vehicle and equipment technology,” said Adam. The show highlights vendors like Durante Rentals and New York – New Jersey Takeuchi who support NYC’s Clean Fleet and Vision Zero initiatives. Other vendors will be offering a wide array of products to improve vehicle safety including cameras, truck side guards, systems to track and manage fleets, and systems to avoid or mitigate collisions. The show also highlights construction vehicles and equipment with alternative fuels and emissions reducing technologies, along with the latest in light and heavy-duty vehicles, trucks, horticultural equipment, tools, fleet services, and more. Grand Central Pkwy., Whitestone Expwy. bet. 111 St. and College Point Blvd., Park Drive E.
Founded in 2009 by three entrepreneurs, Durante Rentals is the most dependable name in construction equipment rentals with locations in the Bronx, Brooklyn, Brewster, Carmel, Elmsford, Flushing, Mt. Vernon, West Nyack, Danbury, and coming soon to New Jersey. Contractors look to Durante for all their construction equipment needs including telehandlers, scissor lifts, generators, boom lifts, conveyors, track loaders, skid steers, ride-on rollers, forklifts and more. Durante Rentals services all five boroughs of NYC, Westchester, Rockland County, Putnam County, Connecticut and New Jersey. For more information about Durante Rentals, visit www.duranterentals.com or call 1-800-DURANTE. New York – New Jersey Takeuchi is an authorized dealer for the New York City, Northern New Jersey, Westchester, Putnam and Rockland County areas. They specialize in sales, rentals, service and parts for the full Takeuchi fleet of earth- moving machines including track loaders, wheel loaders, skid steers, and mini excavators. New York – New Jersey Takeuchi is a division of Durante Rentals. For more information, visit www.nytakeuchi.com or call 1-800-DURANTE.